Just an heads up that this resumes on Thursday evening. Again, it’s all about picking the correct captain because we’ll all end up with very similar teams. All the best for 2019 everyone. With the Abu Dhabi HSBC Championship getting underway tomorrow (Weds, Jan 16), this week's bunkered Fantasy Golf Winter League transfer window will close 24 hours earlier than usual. You only have until MIDNIGHT TONIGHT to select your team for this week's tournaments: Abu Dhabi (European Tour) and the Desert Classic (PGA Tour). Remember: Abu Dhabi is also the first DOUBLE POINTS event of the season. Logged in to change my team this morning and I don’t appear to have that option. I assume they’ve not reset the deadline back to midnight Wednesday after last weeks early start. Contacted them on Twitter and they’ve sorted it. Thankfully avoided that late withdrawal (neck injury). Went with Matt Fitzpatrick who's started well. Louis could have sent me a tweet at least beforehand! I assume that's Mark Addicted Kenny atop the overall leaderboard? I see you did okay on the weekly leaderboard! I'm guessing most went with DJ? Tempted to put some money on him! I also captained DJ and with the rain delays I’ve had to replace him just in case he misses the cut. It’s pretty much guaranteed that he shoots three 65’s now. I went for DJ too, but decided to stick with him. My record of replacing DJ & Spieth is shocking, they always make me pay. I once took Spieth out when he was outside the cut at 11:50pm with 2 holes to go and he was 4th at the end of the 3rd round. Well a 66 sees him just outside the top 20 so I’ve most probably dropped a bollock. 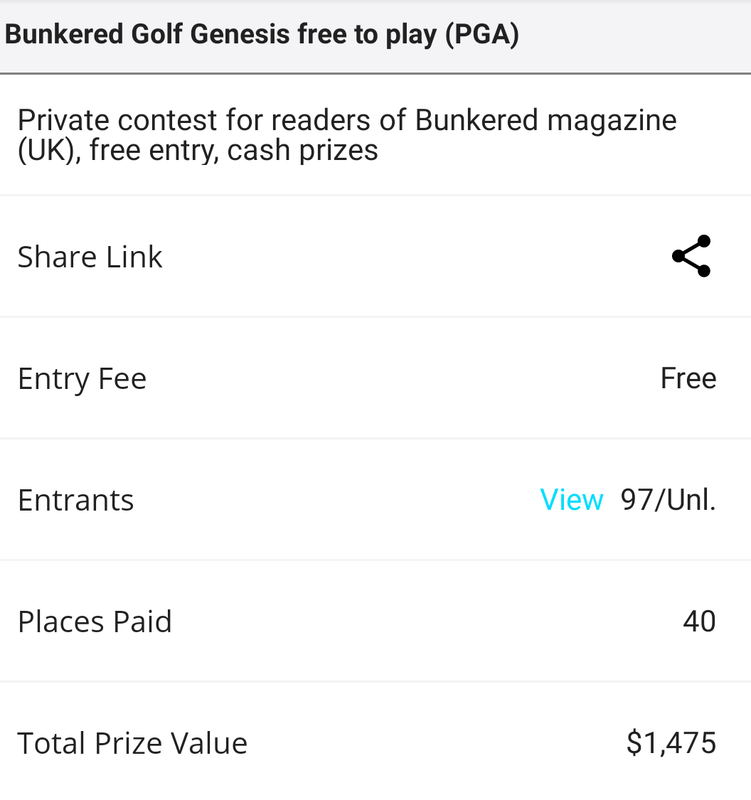 By the way, good to see a fair few of us in the free Bunkered DraftKings competition this week. Great chance for someone to walk away with $1,000, as only 97 people have entered! Got him as captain this week. After captaining DJ the previous two weeks, at the eleventh hour, I decided to move it to JT this week. Also transferred out Patrick Reed and Paul Casey on Friday night whilst bringing in Matt Kuchar in the process. I suspect my flirtation with the upper echelons of the leaderboard is over. I switched from DJ to JT as capt this week too, though he has put up an incredible last round to make it more bearable. Hi guys, yes that is me, not been on here for a while. Hmm, transferring out Fowler wasn't the best move at the weekend. Maybe you should have forgotten to do your transfers like me? So it's all down to The Players 'double pointer'. But they will be protecting their position too, so it's often the case that most go with the safest option as Capt. But who would that be? I guess DJ? An unexpected winner like Moli this week will mean Addicted will probably hold on, and looking at the history of the Players that looks a fairly good bet!